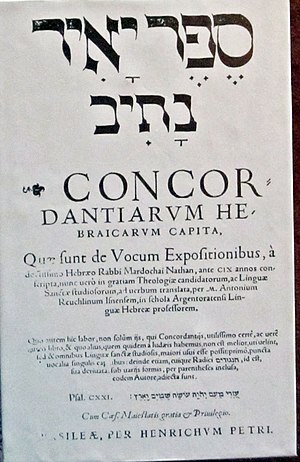 Traduttore traditore, “the translator is a traitor,” is an an­cient proverb oft quoted in books about Bible translations. To a degree this proverb is true, for no translation can perfectly bring over all the meaning and nuances of one language into another. Because no two languages share identical grammar and an iden­tical range of word meanings, not even the best-intentioned word-for-word translation can claim to perfectly represent the original. If the translator is a traitor, the concordance maker must be his partner in crime. For no multilingual concordance can perfectly represent both the English and biblical language texts it indexes. It can perfectly represent the vocabulary of the English text, for it needs only to list the location of each of its words. In this respect a concordance is either absolutely right or absolutely wrong. But when a concordance attempts to display the relationship between the English text and the biblical languages, it falls heir to the same difficulties that face the Bible translator. It appears in the plural form Traduttori traditori (“translators traitors”) in a collection of Tuscan proverbs by the 19th-century writer Giuseppe Giusti; but this is an isolated occurrence which doesn’t appear to have any literary antecedents, nor is there any trace of the route by which it cut loose from its Italian origins and became a free-floating, multilingual cliché. translators conceive their task as being the very opposite of obfuscation; their aim is to make insights, experiences, perceptions which have been expressed in one language accessible to speakers of another. And because, by definition, this involves finding ways to express alien concepts from an alien culture, the process is necessarily imperfect, involving a succession of compromises in the search for an equivalent in the target language. So the translator’s task is not to attempt the impossible but rather to manage the losses in translation and find compensating gains. In a literary translation, it’s not hard to see that this might involve sacrificing literal accuracy for the sake of a more faithful rendering of the style or tone of the original; but a different kind of translator might well make different choices. A user of a textbook or an instruction manual, for instance, will expect the translation to be clear and unambiguous, and would consider some loss of elegance or succinctness as a price worth paying. The bible is so readily available in the English speaking world today that many take it for granted. Yet the history of the translation of the bible into English is one scattered with stories of sacrifices and suffering, even unto death. Similarly, many paid with their lives to ensure that the bible was translated into other languages too, so that others may read about the Good News of God in their native tongue. Two terms are often employed to describe linguistics, terms that one readily associates with ‘scientific’: (1) Empirical: John Lyons observes that “linguistics is empirical, rather than speculative or intuitive; it operates with publically verifiable data obtained by means of observation or experiment. To be empirical, in this sense, is for most people the very hallmark of science” (Language and Linguistics, 38). (2) Objective: Modern linguistics attempts to explain / describe human language for what it is, in as neutral a fashion as possible, without giving in the the layman’s misconceptions about certain accents/dialects/languages being simple versus complex, pure versus primitive, etc. The fabric of our society is built on language use; however, this is taken for granted precisely because it is so pervasive (like breathing). If, as Christian scholars, we desire to understand the nature of things, and if linguistic communication is part of the nature of things (being one of the universal features of human existence), then it behooves us to study it. Bible translators: these folks have the noble task of taking Greek and Hebrew biblical texts and rendering from their source languages into the target languages of a vast number of people-groups. Many of those groups speak a language without the benefit of a written language system. One cannot produce visible ‘texts’ of Scripture for people in this situation without first taking the oral language system, reducing it to a written system, and analyzing it at a variety of linguistic levels (phonetics/phonemics, morphology, syntax, semantics, pragmatics). Only then can one provide suitable renderings in the target language. And none of this can be done well without recourse to linguistic knowledge and theory. Creoles are developed versions of Pidgins. Pidgins are languages formed when English came into contact with the language of an area being colonised. A need to communicate springs up between the traders and the locals, and so the two languages form another. As they would be spoken not by the colonisers but by the locals, they generally took on the lexicon (words) of English (or French, German, Portuguese), and the grammar, syntax, and phonology of the native language. This means it’s easy to speak, but also easily understood. English is not the Bible’s original language, and as the Bible has come down through the ages, it has gone through the hands of many scribes. As such, when under diligent scrutiny, there are possible and probable scribal edits which can create confusion and doubt. whether class or presentation, the aim of any lesson is to have the message engage emotionally, morally, intellectually, and spiritually helping individuals receive understanding so they make application of the Bible’s content. This entry was posted in Uncategorized and tagged Bible, Bible translations, Biblical Index, Biblical languages, Concordance, English language, God, Index, Linguistics, Nuances, Social Sciences, Translation, Translator. Bookmark the permalink.